At SafeandSound Mastering there has been a fairly uniform work flow over the last 3 of 8 years along with numerous studio improvements. Such improvements make achieving precise and repeatable mastering results easier. I shall cover a few areas of mastering in 2017 including mastering for streaming services in this entry. Taking the studio acoustics as far as possible. Notably the acoustics have been improved by the addition of 7 new super chunk type bass traps made from Rockwool RW3 and Camira type fabric.Initially this was quite a difficult job as I had to rearrange some of the existing copious trapping in order not to encroach too much on the studios existing work space. I am pleased to say that due to the rearrangement of existing bass traps it was possible to have virtually no impact on the immediate open space and sweet spot between the monitors. This new and very large trapping has produced an immediate sonic benefit over the already very heavily trapped room. With every acoustic improvement the sonic capability of the PMC IB1S and Crane Song Solaris Quantum DAC are presented in a more refined manner and make for a ruthless and precise monitoring system for mastering. As an engineer it is always good to push the acoustics to their final conclusion in a room as it produces even greater confidence. Especially in the realms of equalization from the deepest lows to the highest highs. Small fractions of dB’s in context of mastering can make surprisingly significant improvements in the perception of audio. These seemingly small details add up to be greater than the sum of parts and subjectively enhance the musical experience for the listener. Overall this is seen as a positive move as most music benefits from not being excessively limited. Good mastering engineers understand this as there is much that can be done to improve music during mastering over and above “making it extremely loud” which typically comes with some sonic compromises. Great attention to equalization (and type), character compression and for some control, transients, depth, stereo image, M/S processing, harmonics and analogue enhancement is what mastering has always been about. Loudness has for the last few years just played a rather more dominant role in the process probably because it is the most obvious parameter heard by human ears. CD releases and tracks for dance music DJ’s are not seeing the same changes and is very much driven by discussion between mastering engineer and client as to the right volume target as per genre and planned usage/release purpose. It is best to communicate what the outlets for the music are and which are most important. In some instances it is preferred (given the budget) to produce multiple masters (louder and less so) which can be presented for online streaming and the CD/DJ counterpart. I suspect this will become more common in the future as music producers understand that the product can be optimized for purpose. I think over the months and years ahead we shall see a return to a lower average volume for masters and this will benefit sound quality. Until such time communication with your mastering engineer is important. At this time I am dealing with each job generously on a case by case basis depending on genre, if there is a cd release counterpart, digital online file distribution etc. It will be an ongoing concern and the approach may change as time goes on as industry and platform specific changes develop. There are numerous automated “mastering” services online and they seem squarely aimed at the beginners market. Now you might think that even speaking of it is admission that it could be a problem, well no. I have never personally understood why such services would gain popularity given the availability of low cost professional mastering services with years of audio engineering experience backing it up. For albums and EP’s it is nonsensical (they need a holistic approach getting multiple tracks to work as a product) and even a single track could have taken months of work to to produce. Leaving this to a cold digital algo seems inappropriate. I have always found that my clients have very much felt the inclusive mix appraisal (when requested) and my careful professional ear over their music and mix, listening for defects and mix errors is of great value.The feedback provided being concise and informative going way above the mastering process alone in providing the best chance of an optimal master. This is coupled with the correction of issues such as clicks and glitches which may have gone unheard. In any event if the mix has an abnormality I always prefer to double check with the client before pressing ahead. The value, connection and complex technical and musical response to productions from a dedicated attentive human will never be replaced by a cold digital algorhythm. Music is produced by and listened to by human beings, the response to music is human, the emotions evoked are human and so to miss this opportunity for valuable human professional input seems short sighted and unlearned. This is music, not number crunching. 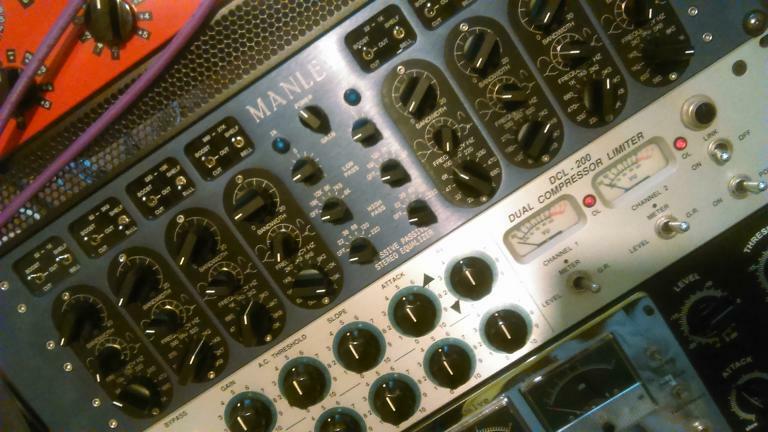 Finally to wrap up on this subject, there is one other major advantage to professional mastering… analogue. It can’t happen in sausage factory digital mastering land. There is a very real reason that professional mastering engineers have a rack of analogue equipment. It simply is not the same as static algorythm and has after 15 years of plug in emulation not managed to be able to successfully take analogue’s place. Getting your music mastered by a mastering engineer is an ongoing relationship that adds value and objective listening experience. I continue to do a lot of vinyl premastering for albums and EP’s at SafeandSound. With the resurgence of a vinyl release for EP and Albums the market for this vinyl pre-mastering service is buoyant. Around 40pct of clients getting their EP or album mastered for online and CD having the vinyl premastering counterpart files delivered as well. I will make sure the files that are delivered to your lathe engineer of choice will correctly cut to vinyl with my pre master quality control and vinyl format specific tweaks. Just inquire when you get in contact. Early in the year I purchased a new PC for the mastering studio which has still not been put into service as yet. The old PC has been working perfectly for 7 years and still does, I like to have the new system built and configured ready to go. I have been doing significant testing of the new custom built audio pc (by SCAN) to ensure reliability before migrating over to it as the main studio PC. The machine has plenty of CPU horsepower, SSD drives and silent passive CPU cooling. I requested the installation of the ultimate in high end power supplies (Seasonic Titanium 850W). This is a silent PC power supply with a 10 year warranty, over engineered for complete reliability. In addition I have been updating some existing software and testing out some new. Any new products are rigourously tested for their sonic qualities before being employed in the mastering DAW. It takes time to really understand if small improvements in DSP are producing real benefits to audio. I take a careful ear selected approach to this and do not rush new products into the mastering process. I have always wanted to give clients a good price for their mastering but never at the expense of the quality of the end results. In fact it has even been suggested that some people have been put off by the low pricing. That is a shame, but to those people I say give me a try and you will be pleasantly surprised. I aim high and you have nothing to lose by putting your price bias aside and finding out for yourself. 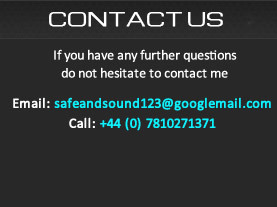 Clients of SafeandSound Mastering to which I owe gratitude for their ongoing support and trust over the years know their music is being worked upon with serious mastering grade studio equipment. I appreciate that people value consistency in pricing and approach and there will be no drastic increases, prices may increase slightly in the future but none are planned for the time being. I welcome clients from every region of the globe with the same enthusiasm and professional friendly approach. It would be easier to list the handful of countries in which I have not worked with people, making the mastering service I provide truly global. As things change in the world and music business I will remain true to my plan of excellent mastering results, good communications, providing help to new and professional musicians, bands, labels and producers alike. Giving advice, using serious equipment at an unbeatable price. I am very appreciative of the support so I have been able to provide 8 years of my professional career dedicated to mastering audio. If you found this of interest and are interested in having your music professionally mastered please do not hesitate to get in contact….please also feel free to share on social media and other online audio hangouts, the more the merrier !